Click map for full view. Taliban presence, by district, in Kandahar, Uruzgan, and Helmand provinces. 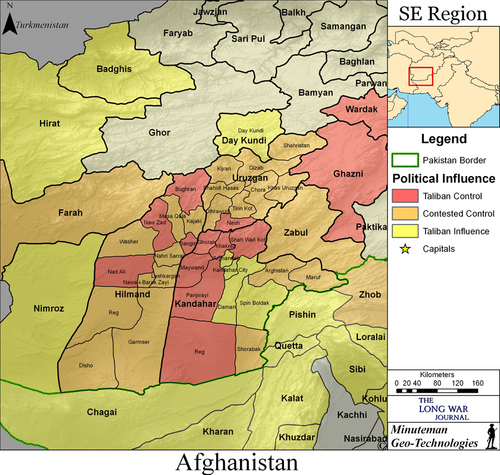 Information on Taliban presence obtained from open source and derived by The Long War Journal based on the presence of Taliban shadow governments, levels of fighting, and statements from ISAF commanders. Map created by Bill Raymond for The Long War Journal. Last updated May 26, 2009. As Afghan and US forces complete an operation that targeted a Taliban stronghold in northern Helmand province, another area is identified as a Taliban safe haven that hosts al Qaeda training camps. The Baghran district in northern Helmand hosts several camps run by al Qaeda’s paramilitary Shadow Army, several military and civilian sources told The Long War Journal. Hundreds of Taliban and al Qaeda fighters have rotated through the Baghran camps. The Shadow Army, or the Lashkar al Zil, is al Qaeda’s paramilitary force that closely operates with the Taliban and other jihadi groups in Afghanistan and Pakistan [see LWJ report, Al Qaeda’s paramilitary ‘Shadow Army’]. Some of the complex attacks in Kandahar and Uruzgan are thought to have been carried out by fighters trained at the Baghran camps, including the Feb. 2 suicide attack inside a training center for police reservists in the town of Tarin Kot in Uruzgan province. Twenty-one Afghan police were killed and seven more were wounded in the suicide attack. Baghran, the northernmost district in Helmand, is located in a remote and mountainous region, and serves as an ideal sanctuary for the Taliban and al Qaeda operating in southern Afghanistan. There are no Coalition forces present and the region is largely unpatrolled. Mullah Dadullah Mansour, at the time the military commander in the south, and Mullah Abdul Rahim, a senior commander in Helmand who operates from Pakistan, were both reportedly in attendance. Both leaders survived the strike. Locals claimed that more than 50 civilians were wounded but the US military maintained that only Taliban fighters were killed or wounded. The district of Nad Ali in Helmand also serves as a safe haven for the Taliban and al Qaeda and hosts camps for the Shadow Army. In that district, Afghan and Coalition forces recently completed a four-day operation in the village of Marja, which was described by the US military as a “key militant and criminal operations and narcotics hub in southern Afghanistan” and “a main command node.” According to Quqnoos, an English-language Afghan news outlet, Marja has been under Taliban control for more than a year and a half [see LWJ report, Afghan and US forces battle Taliban in northern Helmand stronghold]. The military said more than 60 Taliban fighters were killed during the operation as the Taliban “mounted an ineffective and uncoordinated defense” of the village. No Afghan or US troops were reported killed during the fighting, and more than 223 tons of narcotics and 37 tons of materials used to make explosives were seized. Afghan and Coalition forces cordoned the town’s main bazaar, where Taliban command and control centers and narcotics and bomb factories were located, and then called in airstrikes to destroy the buildings. US and Afghan military officers deemed the operation a major success. “The commandos thoroughly demolished a vital operational, logistical, and financial hub for the enemy and completed this mission victorious as the militants and criminals crawled away defeated and operationally-neutered,” Ministry of Defense spokesperson Major General Mohammad Zahir Azimi said in a US military press release.. But Afghan and US forces did not remain in Marja to deny the Taliban and al Qaeda the opportunity to reestablish control of the region, according to a report in Quqnoos. “The troops have left the area after the operation and the area is again under the control of the Taliban,” said Daud Ahmadi, the spokesman for the governor of Helmand. A US military officer said the raid in Marja is the best that can be done at this time because too few forces are available to secure all of the territory in southern Afghanistan. This summer, the US will send an additional 17,000 troops to help stabilize the deteriorating security situation in Afghanistan. More than 8,000 Marines and 9,000 soldiers will be deployed to Afghanistan by this summer. The bulk of these troops will be deployed to the eastern and southern provinces where the Taliban control wide swaths of territory. The fighting in Helmand is expected to intensify as the Marines from the 2nd Marine Expeditionary Brigade are deploying in the province and will also be operating in neighboring Farah province. The Marines have established two bases, Camp Dwyer and Camp Leatherneck, to support operations in the south. Camp Dwyer is a forward operating base that will host the majority of the Marine forces. Leatherneck will host a battalion of Marines and the brigade’s air combat element, which has more than 60 Harrier and Hornet attack aircraft, 12 Cobra attack helicopters, and more than 90 transport helicopters. The thing I don’t get a sense of is whether the Taliban is currently making much headway in setting up new operations and assets in Afghanistan. A lot of what is now being uncovered seems to have been in operation since last year or before that. Nato was quickly losing ground in 2007 and 2008 but that trend seems to have slowed a bit over the last eight months. The fighting season still isn’t in full swing and the weather has been wet this spring. In spite of some problem, I think Nato has kept the pressure up better than in previous years. I also think we have put a serious dent in the Taliban’s plans for the Kabul area. I’m beginning to think a 30% uptick in Taliban activity might be toward the high end of what they are capable of this year. I still worry about gaps where the Taliban is not monitored. This is the stuff that drives me crazy. Everyone says worry about Pakistan but there they are in Afghanistan right under our noses. That one line about we never patrol that area. Oh my gosh! I know we don’t have the forces in place but come on. Osama could have been there this whole time. How would we know he wasn’t? Also, it’s about time these extra troops got there. I have been hearing this for months. I know there is some training and logistics etc but months. My nephew was in Iraq and in a matter of weeks they transferred the entire Marine battalion to the Hindu Kush. What is the holdup? Political, logistical, economical? Clear and Leave was really good way to go. They should make at least 3 clear ops before Hold. Patrolling would be suicide, and also result in troubles to civilians. It is music to ears to see hardly any military casualties in such a big operation. Forest is the hideout even in Swat. Night vision should help. The Thunder Run has linked to this post in the blog post From the Front: 05/27/2009 News and Personal dispatches from the front and the home front. While two month’s data does not make a trend, the low US casualties in Afghanistan during April and May 2009 versus 2008 suggest that the Taliban increasingly are stymied by the new NATO forces there as well as Pakistani forces across the border. Moreover, given the reports of Taliban fighters moving from Afghanistan into Pakistan to reinforce positions in Swat and neighboring areas, one might conclude that the Taliban’s own forces are also stretched thin. If NATO could eventually raise Afghanistan’s army to ~200,000 while Pakistan’s Army expands current efforts on the “second front” — including the closing of all madrasas, the areas under Taliban control in both countries might be eliminated within three years. So long as the Taliban have a sanctuary anywhere, the war will continue in both countries. Unfortunately, the US’s Afghanistan “surge” of 17,000 troops being added to the existing 40,000 in theater will likely prove insufficient for the twin tasks of clearing/holding territory and training Afghan troops. If the Marines can get a fix on them, the t-ban may be drawn into a battle, where superior firepower will overwhelm them. In any case, thier stay in N. Helmand will not be very long. Like any insurgency, there is a need for a “safe haven”..Cordell is right. Bomb the madrossas to dust, and give them no room to breathe.